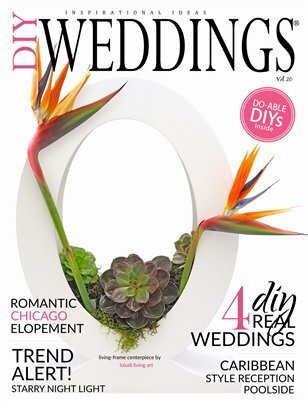 This issue of DIY Weddings Magazine is packed full of romance! Starting with a Romeo & Juliet style shoot [page 34}, a vintage hairstyle "The Victoria" tutorial (page p62), a romantic elopement in Chicago (page 69), a Caribbean style reception poolside (page 124) and a romantic floral inspired photo shoot (page 137). I am excited to announce two new magazine partners: Kristi Richardson, owner of Bloomed To Last and Laura Clausen, owner of Dish Wish. Let’s talk about the cover! This fabulous living art centerpiece is the creation of natural interior designer, Liz Fiorentinos, owner of luludi living art. Check out her stunning terrarium creations (page 170). And finally, you’ll be inspired by our four amazing couples in our Real Weddings section who share their photos and creative ideas from their weddings (page 82).